Know ye that at Johnstown in the County of Montgomery, before James Lansing EsquireSurrogate of our said County, personally appeared Julia Hanchet Daughter of John Hanchet late of the Town of Charlestown in the County aforesaid decreased an Infant above fourteen and under twenty one years of age; and also Nathan Kimball of the said Town of Charlestown Esquire, the said Julia Hanchet having then and there chosen the said Nathan Kimball for her Guardian and the said Nathan Kimball having assented thereto. 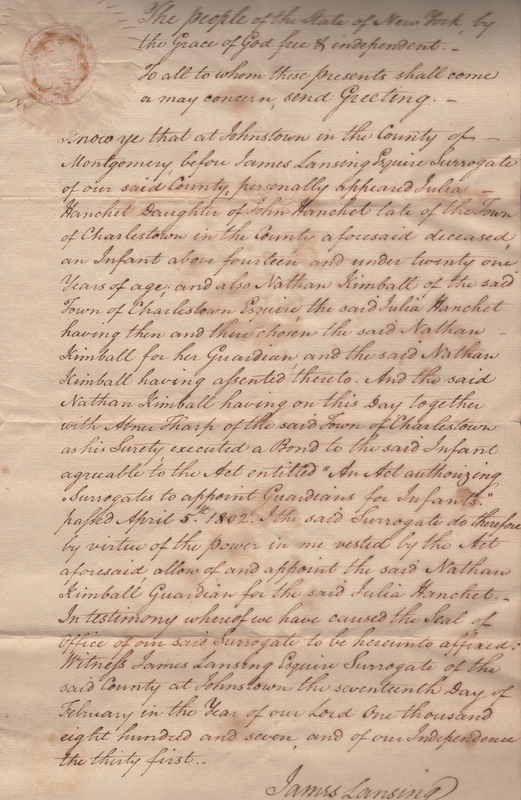 And the said Nathan Kimball having on this Day together with Abner Tharp of the said Town of Charlestown as his Surety executed a Bond to the said Infant agreeable to the Act entitled “An Act authorizing Surrogates to appoint Guardians for Infants” passed April 5th 1802. I the said Surrogate do therefore by virtue of the power in me vested by the Act aforesaid allow of and appoint the said Nathan Kimball Guardian for the said Julia Hanchet. – In testimony whereof we have caused the Seal of office of our said Surrogate to be hereunto affixed. Witness James Lansing Esquire Surrogate of the said County at Johnstown the seventh Day of February in the Year of our Lord One thousand eight hundred and seven and of our Independence the thirty first. This entry was posted on Saturday, January 4th, 2014 at 8:10 PM	and posted in Uncategorized. You can follow any responses to this entry through the RSS 2.0 feed. « Tuesday’s Tip: HistoryGeo.com – You Can’t Live Without It!